We operate from a 7000 Square foot warehouse in North Cornwall. Our warehouse is fully pallet racked out, with stock in place and garments hanging on rails for easy viewing. We welcome new and old customers to come to our warehouse to view stock. It is always worth ringing our office to ensure the correct person is around to help you prior to making a long journey. Access to us is very easy, as we are located just off the A30. As you come off the A30 (sign posted Launceston, South Petherwin, Pennygillam), you will come straight to a roundabout, called Pennygillam. Take the 3rd exit off the roundabout - sign posted Pennygillam Industrial Estate. Head up the hill onto Pennygillam Way. Continue up this road for about 600m where our warehouse can be found on the left hand side, opposite the very large factory Kensey Foods. You will pass Martin Cash and Carry, on the right. Pass City Electrical Factors on the right hand side. Drive a further 100m where you will see Westcountry Conveyers. From here our warehouse is on the left hand side. 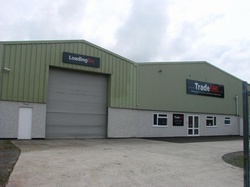 Look for the 2 large green warehouses and large Black and red sign saying "www.Trademill.co.uk"
If you want to visit us by train, our nearest train station is called Bodmin Parkway. A taxi can be taken into Launceston to reach our warehouse, however it is about 20 miles. If we have a free member of staff, we can sometimes pick you up from the train station. Tel 01566 774464 or 07811184433 if you get any problems.